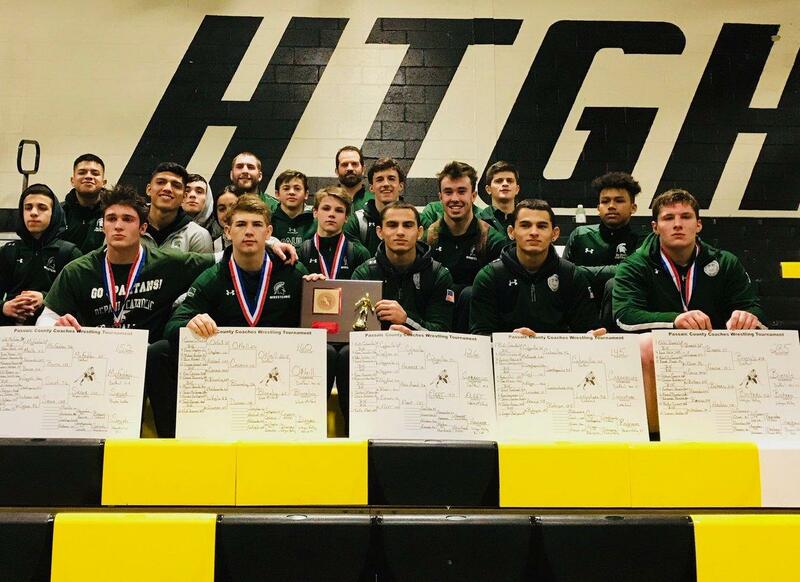 A seventh straight Passaic County Tournament championship for DePaul is keyed by Ricky Cabanillas, Nicky Cabanillas, Connor O’Neil, Luke McFadden and Eddie Bierals; Spartans now looking to another state championship and eventual trip to Boardwalk Hall | Mike Lamberti, From Margate To Cleveland, And Back ! Bonus points were key for DePaul, as the Spartans captured a seventh straight Passaic County Tournament championship, winning by 34 points over second place Wayne Valley, in a field of 13, on Jan. 26, at West Milford High. Coach Keith Karsen’s team was scheduled to close out the regular season with a match against Watchung Hills, on Feb. 2. DePaul was then scheduled to face Bishop Ahr in the semifinals of the North Non-Public B sectional tournament, on Feb. 6, at home. A win there would move the team into the finals, most likely at defending champion Pope John, on Feb. 8. If DePaul wins the North B crown, it would travel to Toms River, on Feb. 10, for the Non-Public B state championship, against the South B winner. Camden Catholic is the top seed in the south. DePaul had won eight straight North B titles and four consecutive Non-Public B state crowns before losing to Pope John last season. Karsen was pleased with his team’s effort at the counties. The Spartans took control with a dominant effort in the quarterfinals. With 11 Spartans heading to the semifinals, DePaul ended the tournament with five champions, along with two finalists and one third place finisher. State champion Ricky Cabanillas won the 145-pound title while twin brother Nicky Cabanillas captured gold at 126. Connor O’Neil continued his dominant season with a 160-pound crown, Luke McFadden repeated as a champion at 152 pounds and heavyweight Eddie Bierals also won his weight class. Finishing second for DePaul was Nick Bottazzi at 113 pounds and Stephen Barone at 170. “I felt our kids would do well, with the kind of competition they’ve faced all season long,” said Karsen. ‘I wasn’t worried so much about individual records. Derek Russell ended up defeating the top seed at 120 pounds and our 220 pounder, David Drouet, defeated the second seed, in the quarterfinals. We were without our 138 pounder, David Ferrandiz, and Michael Esposito, at 132, had an injury default in the counties. We’re hoping to be healthy heading into the sectional tournament.